An upsurge in mass demonstrations and rebellions across the United States portends much for developments in 2015. None of the underlying factors associated with the rise in police killings and other racist incidents have been seriously addressed by the federal government and the economic elites.. The profound disconnect between the ruling Democratic and Republican parties and the African American masses was starkly revealed during 2014 when voter turnouts were low yet tens of thousands went into the streets to demonstrate against police terrorism and the racist character of the criminal justice system. These militant protests and urban rebellions were not planned by the mainstream Civil Rights organizations but grew out of the objective conditions facing tens of millions across the country. Entering 2015, the political superstructure of the U.S. is dominated by right-wing ideology that completely ignores the growing demands for decent wages, adequate housing, quality education, an end to law-enforcement abuses and the cessation of military hostilities abroad. The Democratic Party, which appeals to the workers and oppressed during election years seeking their votes, advances no concrete programs to alleviate the suffering and impoverishment of growing numbers of people. Unemployment, underemployment and poverty remains extremely high. The decline in the labor participation rate serves to conceal the actual magnitude of the problem. Such statistics undoubtedly illustrates that despite the passage of the Civil Rights Act of 1964 and the Voting Rights Act of 1965, fundamental issues of jobs and income remain unresolved in the U.S. The refusal of the federal government and the corporate community to enact any form of a national jobs program means that these indices will continue at the same rate or become even more disparate among African Americans and whites. As it relates to the poverty rate within the U.S., the Henry J. Kaiser Family Foundation reported that in 2014 overall it stood at 15 percent. Nonetheless, when race is taken into consideration, whites were reported to have a poverty rate of 10 percent while African Americans stood at 27 percent, 170 percent higher. The Latino poverty rate was 24 percent just three points below African Americans. 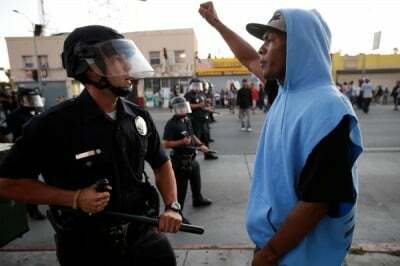 Consequently, it is not surprising that African Americans are expressing mass opposition to the status quo. Historically, it has been this oppressed nation within the confines of North America that has led the way in all significant democratic and working class movements. A “white backlash” against the demonstrations demanding justice for Michael Brown, Eric Garner, Tamir Rice and others is already very much in evidence. Police organizations backed up by politicians are decrying any form of sympathy expressed towards the African American and other oppressed people who are being gunned down in the streets by the cops. These developments are taking place 50 years after Dr. Martin Luther King, Jr. and SCLC went into Selma, Alabama escalating an already existing struggle for voting rights. Since 1965, many African Americans have been elected to public office and have entered job categories in which they were previously excluded. However, the fundamental contradictions between the majority of the African American people and the capitalist ruling class remains. Most African Americans have been negatively impacted by the restructuring of the economic system over the last several decades. The housing crisis and the deterioration of the public sector, including both municipal affairs and education, have disproportionately robbed homes, jobs, incomes and essential services from tens of millions living in the cities and suburbs. Ferguson, Missouri, where the rebellions and mass demonstrations erupted in response to the police killing of Michael Brown on Aug. 9, represents a microcosm of African American life in the U.S. Even as it relates to the question of voting rights, a Supreme Court decision in 2013 struck down the enforcement provisions of the 1965 bill. The U.S. Congress has not taken any meaningful action to restore the basic access to the franchise which is ostensibly a by-product of any bourgeois democratic system of governance. Malcolm X in a speech before the Militant Labor Forum in New York on Jan. 7, 1965 said that the year would be one of the bloodiest on the racial front in U.S. history. His own life was taken that year followed by bloody Sunday on March 7, the Watts Rebellion beginning on Aug. 11 and the founding of the Lowndes County Freedom Organization (LCFO), the original Black Panther Party in Alabama in the aftermath of the Selma to Montgomery March. The independence of political action by the African American masses must lead to new organizational forms and alliances. Capitalism as a system has run its course and therefore requires a major political movement towards national liberation and socialist reconstruction.